International delivery company UPS is backing a startup using drones in Rwanda to transport life-saving blood supplies and vaccines, underlining the wide potential for the unmanned aircraft and helping bring package delivery by drone to U.S. consumers a step closer. U.S. companies are keen to use drones to cut delivery times and costs but hurdles range from smoothing communication between the autonomous robots and airplanes in America's crowded airspace to ensuring battery safety and longevity. As far back as 2013, online retailer Amazon said it was testing delivery using drones and Alphabet Inc.'s Google has promised such a service by 2017. Leading retailer Walmart is also testing drones. But UPS, Walmart, legal experts and consultants say overcoming U.S. regulatory hurdles and concerns over drone safety will require vast amounts of data from real-time use -- with testing in the near-term limited to remote areas of the United States or in other countries. UPS will provide a grant of $800,000 plus logistical support through the UPS Foundation to a partnership including Gavi, a group providing vaccines to poor countries, and robotics company Zipline International Inc. for drone flights in Rwanda starting in August. The drones will deliver blood and vaccines to half the transfusion centers in the country of 11 million people, making deliveries 20 times faster than by land. 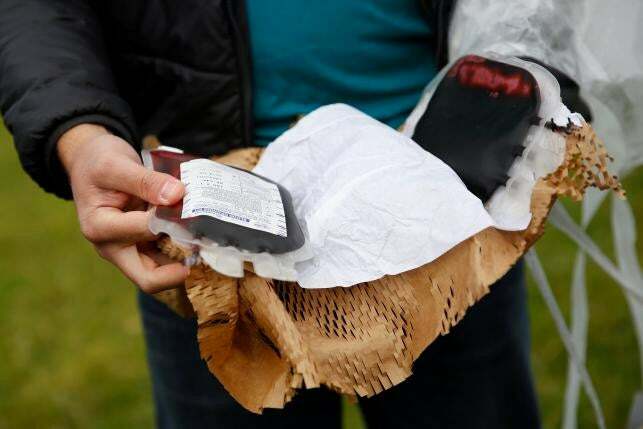 Keenan Wyrobek, head of product engineering at Zipline International, displays a package of fake blood airdropped by a Zipline drone during a flight demonstration at an undisclosed location in the San Francisco Bay Area, California. "Tens of thousands of hours of flight logged in an environment where it's much easier" to operate will help make package delivery a reality in the United States, Zipline chief executive Keller Rinaudo told reporters at a presentation late last week. The Federal Aviation Administration (FAA), which has adopted a step-by-step approach to drones, will soon release finalized rules for small drone use that will most likely limit their use to within the "visual line-of-sight" of an operator or observer. "If you're looking for an economically-efficient way to deliver packages, you'd be better off using a bicycle," said Ryan Calo, an assistant law professor at the University of Washington specializing in robotics. The hurdles to using drones to deliver packages to consumers include technology, communication, insurance and privacy. Questions remain about battery life and safety, especially after lithium-ion battery problems resulted in a fire on board a parked Boeing 787 in Boston in 2013. Safe communication between drones and with airplanes in America's busy airspace is years away. The National Aeronautics and Space Administration has been working on a drone traffic management system and will pass its research to the FAA in 2019 for further testing. In the push for autonomous cars and trucks, companies like Google and Daimler have turned to individual states such as Nevada, which has issued licenses for testing on its roads. But the FAA controls all U.S. airspace, so permits on a state-by-state basis will not suffice for drone testing. "You really do have to make sure the FAA is in the boat and we are really focused on that piece of it more than anything," said Mark Wallace, UPS' senior vice president for global engineering. As part of its strategy, UPS has invested in Boston-based drone manufacturer CyPhy Works Inc.
UPS will focus on projects like Rwanda and testing drones in remote U.S. areas in the near-term, he added. Walmart said last year it plans to test drones for package delivery. The retailer is "more likely to start with short hops" in rural areas, spokesman Dan Toporek said. "It has to happen a step at a time, which will teach us, and will provide insights to the FAA and the public on 'this is how it could work.'" Amazon did not respond to a request for comment. Google referred Reuters to previous statements that the company hopes to operate a delivery service by 2017. Data from companies like number-two U.S. railroad BNSF, owned by Warren Buffett's Berkshire Hathaway Inc., could also prove valuable, said Logan Campbell, chief executive of drone consulting firm Aerotas. BNSF has an exemption from the FAA to operate drones out of the line of sight along its rail network. Campbell said while drone manufacturers would like to see the FAA move faster, the "nightmare scenario" would be if a drone crashed into a manned aircraft. "We have to get this right," he said. "If we move too fast and there's an accident, it could ruin the entire industry."